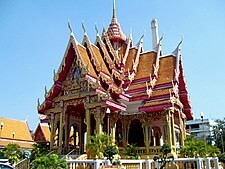 Bangkok Shrines reflect a rich variety of deities, Brahma, Ganesha, Kuan Yin, Kuan Yu dating back for centuries, a legacy of the Indian scholars who introduced Buddhism to Thailand and early Chinese immigrants. The worship of these deities is inextricably linked with the practice of Buddhism in everyday life. The reputation of some of these shrines has even drawn foreign worshippers to the city. 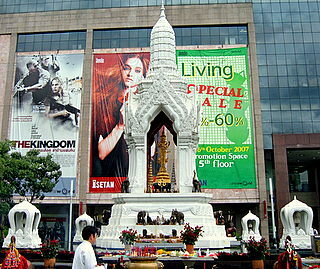 The highest concentration of shrines dedicated to Hindu gods and a goddess is around the Ratchaprasong junction. Each commercial building has a deity as its guardian and patron saint. 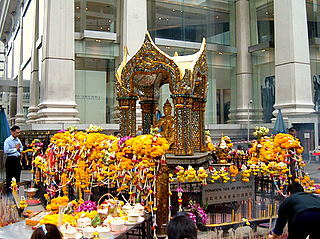 Of all the Bangkok shrines, the most popular among Thais and foreigners is the Erawan Shrine a shrine visited by hundreds everyday. 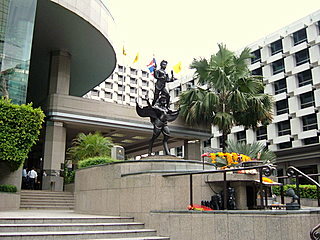 The shrine has a gripping legend that deeply influenced the fate and name of the hotel behind it, the Grand Hyatt Erawan Hotel. Commonly called the four-faced Buddha the shrine is actually a four-faced statue of Brahma, one of the Trinity of Hindu Gods. Erawan is, in fact, the name of Indra's three-headed elephant! The aura of Erawan is so strong that the boutique shopping mall nearby that opened in November 2004, adopted the name Erawan Bangkok. 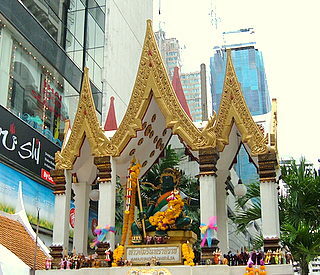 Another popular shrine with the locals is the Trimurti Shrine across the road in front of Central World Plaza. Trimurti refers to the Trinity of Hindu gods, Brahma, Vishnu and Siva. 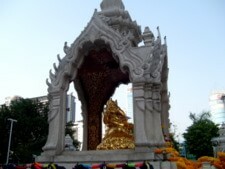 The Trimurti Shrine is one of the Bangkok Shrines with a very romantic allure.Called the Lovers' Shrine, many believe that those who pray here for true love will have their dreams fulfilled. Located next to the Trimurti Shrine is the Ganesha Shrine dedicated to Ganesha, the son of Siva who severed his son's head in a fit of rage. The deity has an elephant head and a human form. The Elephant God of accomplishment, success, wisdom and wealth attracts many worshippers. 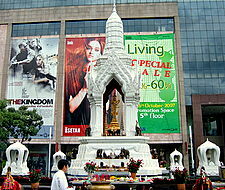 Across the road in Gaysorn Plaza, a luxury shopping mall, is the Lakshmi Shrine a shrine dedicated to the Hindu goddess Lakshmi, the goddess of wealth, beauty and prosperity. At the entrance to the Intercontinental Hotel, just next to Gaysorn Plaza, the Vishnu Shrine honors the Hindu god Vishnu, the protector of life, the preserver of the universe and the consort of Lakshmi. 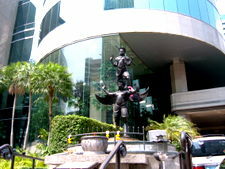 Opposite the Intercontinental Siam is the last of the Hindu gods around Ratchaprasong junction. 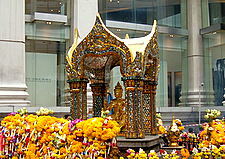 This is the Indra Shrine, for the supreme god of Hinduism Indra, the god of thunder and rain, the god of war and the deity for Amarin Plaza. 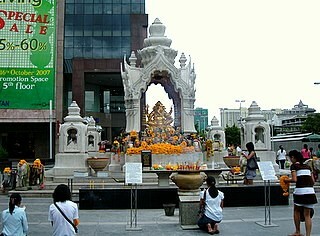 This completes the Hindu Shrines around Ratchaprasong. 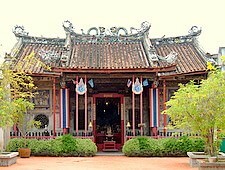 Besides the Hindus, the Chinese also had profound influence on a number of shrines in Bangkok. One of the most famous is the Kuan Yin Shrine built by the Chinese community on the Chao Phraya River in the reign of King Rama III (1824 – 1851). The shrine is dedicated to the legendary Kuan Yin, the ancient Chinese goddess of mercy dating back to 300 B.C. Kuan Yin embodies the virtues of love, kindness, compassion and forgiveness. The goddess of mercy is a patron saint and savior of the sick and destitute and a protector of sailors and fishermen. Further downriver is another old Chinese shrine, the Kuan Yu Shrine in memory of Kuan Yu, the God of War, an ancient Chinese general renowned for his courage, loyalty and integrity, a guardian and protector of the realm. Despite his military prowess, he was also deeply religious and sought the way of peace and righteousness. A very unusual Bangkok shrine, that's not dedicated to a god or deity but to a legendary female ghost, is the Mae Nak Shrine in Wat Mahabut in Phra Khanong district. 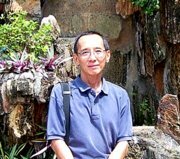 The various Bangkok Shrines provide a spiritual path for those who seek the fulfillment of their hopes and aspirations in a social milieu that's a rich fusion of faiths and cultural diversity.